Fabian Nicieza | "How Would You Fix...?" 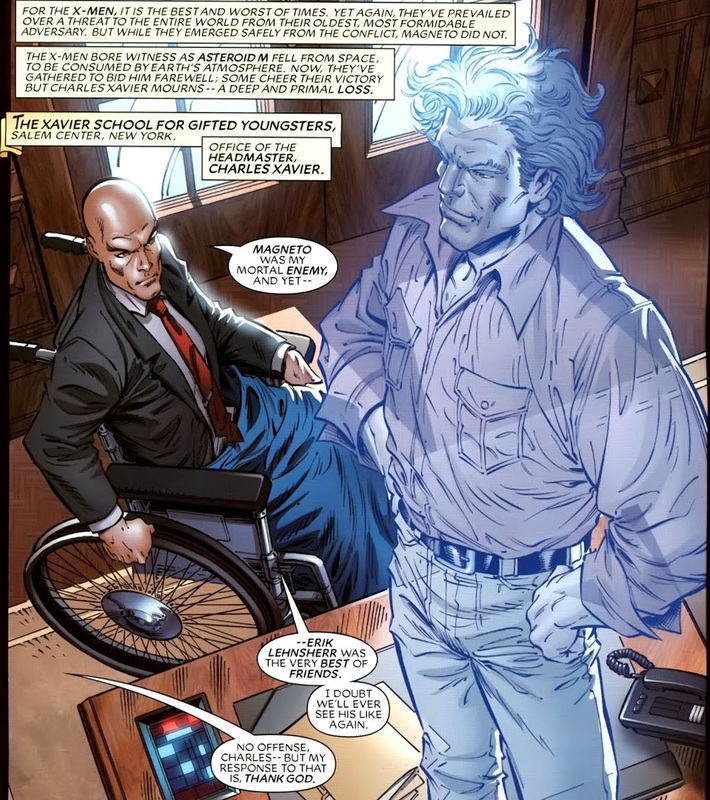 Figure 1: Ahab's introduction in the Days of Future Present crossover. Ahab was the “Master of the Hounds” from the Days of Future Past future – the one that Rachel Grey hailed from. Hounds were mutants with powers useful for tracking other mutants, who were controlled by Ahab in that timeline. Back when Cable still didn’t have a past, Ahab was introduced in the Days of Future Present crossover (Fantastic Four Annual #23, X-Factor Annual #5, New Mutants Annual #6, Uncanny X-Men Annual #14). During one fight scene during this crossover, Cable and Ahab get close to one another, and Cable is shocked to recognise something familiar in Ahab, reinforced to readers further when Ahab says: “What’s wrong Cable? See someone you know?” (cf. Uncanny X-Men Annual #14). 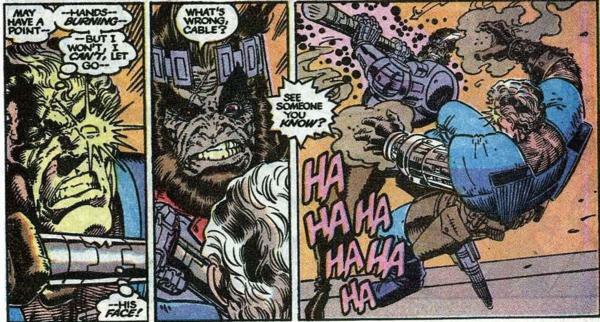 and his recollection that when he was a child – prior to manifesting his powers – Cable seemed like such a monster (cf. New Mutants #93, page 14). – while experiencing a heightened state of stress, provides a reasonable excuse for Rictor’s misplaced paranoia. I do think Louise Simonson had somewhat of a plan for Cable negative relationship with Rictor – and no I don’t think it was the later revelation of Stryfe being his doppelganger – which I believe was somehow tied into his having previously worked as a government agent who went “rogue” (cf. New Mutants #88), his past with Moira MacTaggert (cf. 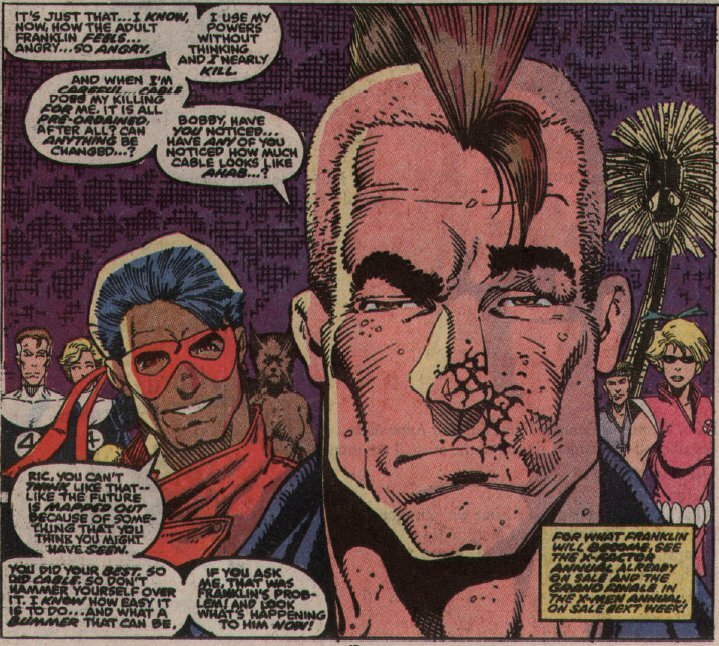 New Mutants #89), his past connection with Sunfire and the Yashida Clan (cf. New Mutants #93) and the outstanding scores with Wolverine and his previous link to Madripoor. 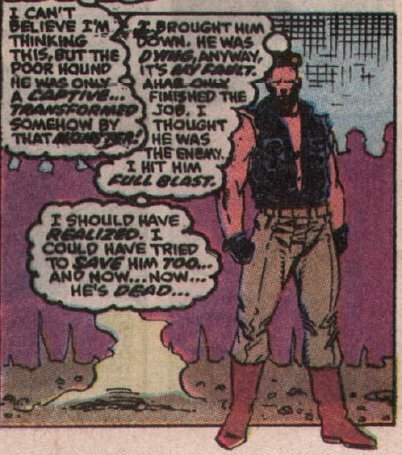 However, I’m certain the intention was NOT to impose Ahab’s origin onto Cable to resolve the fact that they didn’t initially have a background for him, but that it was planted as a RED HERRING! Fabian Nicieza claims the latter, suggesting Bob Harras pushed for the dialogue in Uncanny X-Men Annual #14; though I’m not entirely convinced it was him primarily since the dialogue at the time seemed indicative of Claremont’s well-known catch phrases – which I’ll expound below. While Cable and Ahab did have some similar features, there are more distinct differences, than similarities, during Ahab’s introduction in the Days of Future Present Annuals. 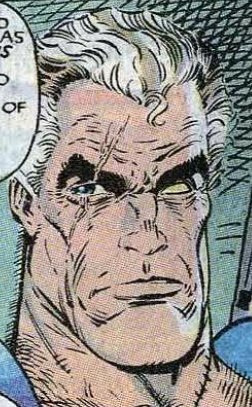 While both characters had similar scars across their right eyes, Cable’s left eye was the bionic one. 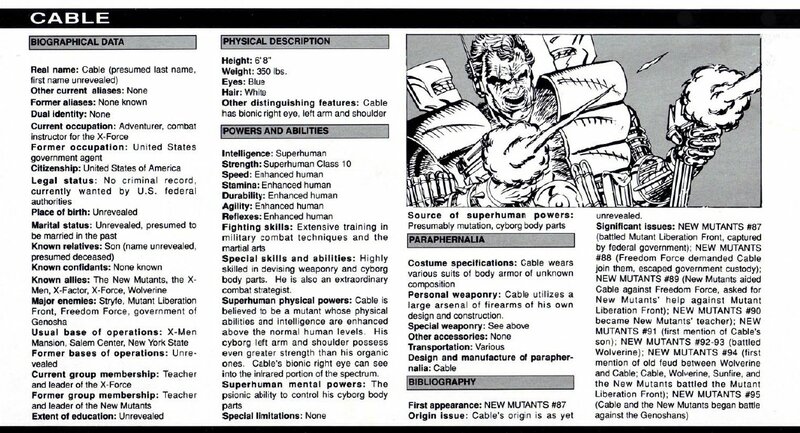 Figure 9: Physical Description notes mistakenly that Cable has bionic right eye, from Marvel Universe Master Edition #3. 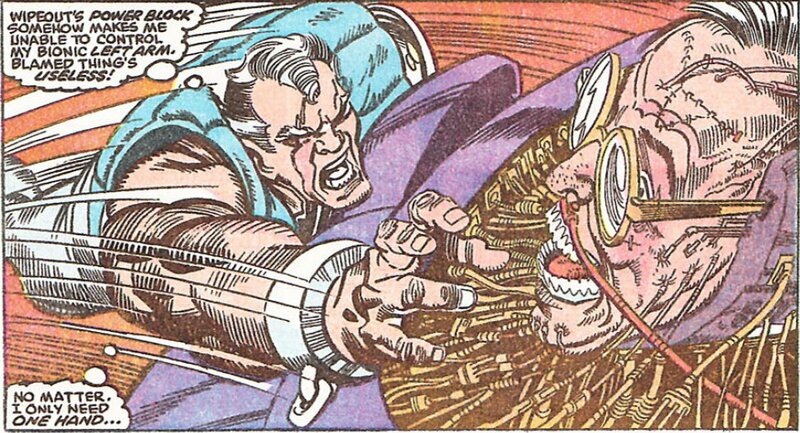 Figure 10: Cable indicates his left eye as the bionic one - unlike Ahab's which is the right one - from New Mutants #89, p.26. page 18 showing Ahab’s left eye as brown, his right eye being the bionic one. 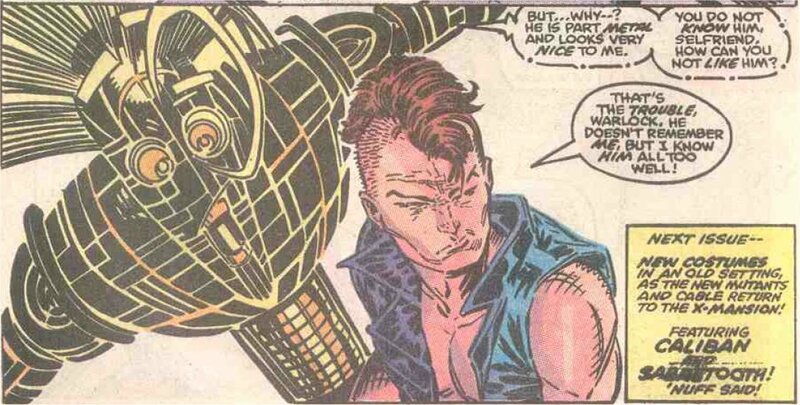 Figure 14: Further evidence of Forge's bionic design, from New Mutants #66 cover. 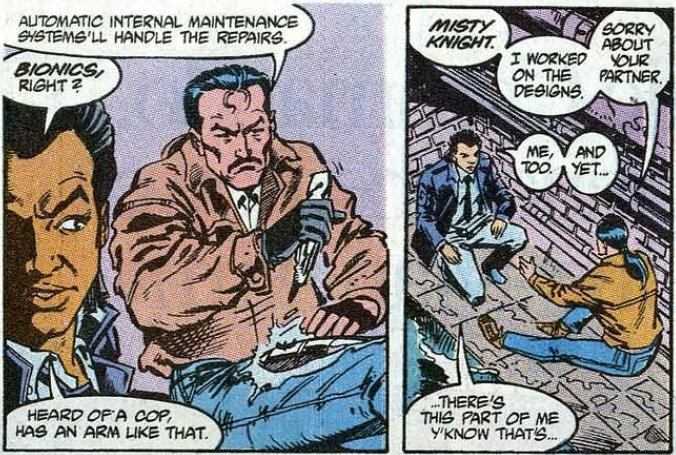 (given the similarity of Forge’s design it is most interesting that he claimed credit for Misty Knight’s cyborg arm in UXM #264). 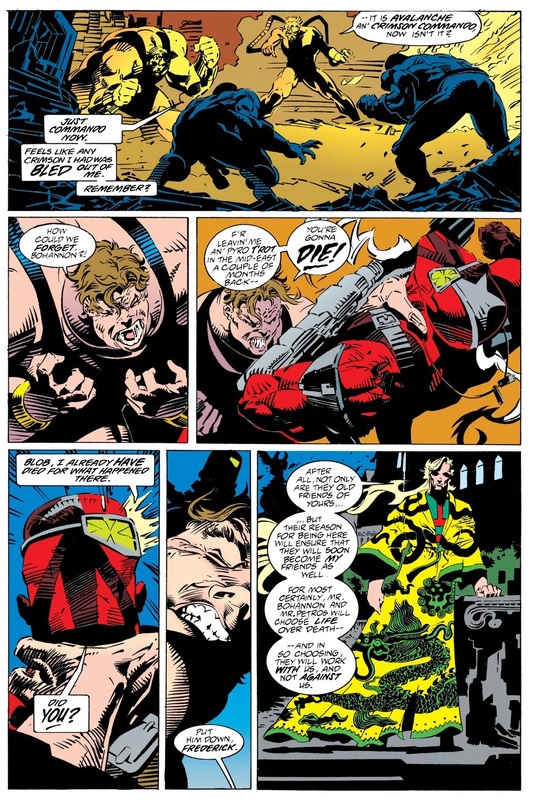 Figure 15: Forge claiming credit for Misty Knight’s cyborg arm in Uncanny X-Men #264, p.8. 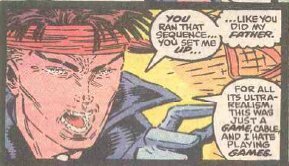 In addition, on page 18 of X-Men Annual #14 (1990) Ahab calls Cyclops “laddie-buck”, definitely not indicative of Cable’s speech patterns. This was a well-known Claremont idiom regularly used by his Welsh character Dai Thomas, who I might add he originally introduced as an anti-superhero police officer and friend/ member of Joseph MacTaggert’s infantry in the Royal Marine Commandos. Also, according to Banshee in New Mutants Annual #6 (p. 18) Cable was in Madripoor at the time Ahab was rounding up fellow mutants with Rachel. What this all suggests is that Cable obviously recognised Ahab in Annual #14, but it doesn’t necessarily mean that he was recognising himself. It could alternatively suggest that Cable may have encountered Ahab in his former identity, before he became “Master of the Hounds”. What was that former identity, you ask? The one thing that has been completely overlooked in the two decades since Ahab’s introduction is his going grey in a really unusual pattern. I still can’t believe I am the only one who picked this up, but I’ve noted no one else make the same particular reference online over this whole time. The only question remaining with regard to Ahab is whether he is Rogue’s father, brother or son. Unlikely that he is her father or brother since Ahab is obviously Welsh or Scottish and Rogue was born in Mississippi. However, could he be Rogue’s son? During Uncanny X-Men #278 the Shadow King seduces Rogue. What if Claremont intended her to become pregnant by him, with Ahab? 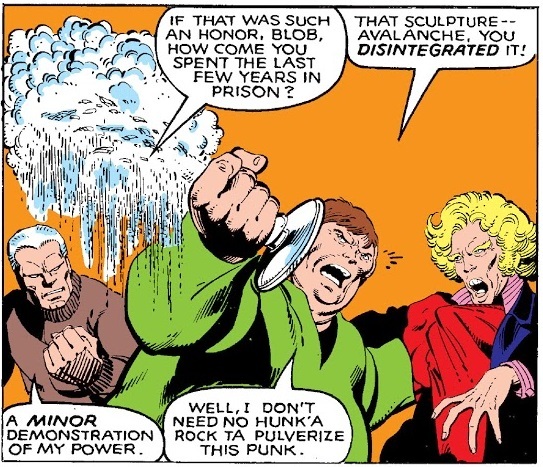 When she comes to realise what has occurred, perhaps Claremont didn’t originally intend her to return to the team right away, but rather have her remain on Muir Island to give birth. She swears Moira to secrecy about the pregnancy (who likely empathises Moira, given the father of her own child was a monster), and after giving birth returns to the X-Men. 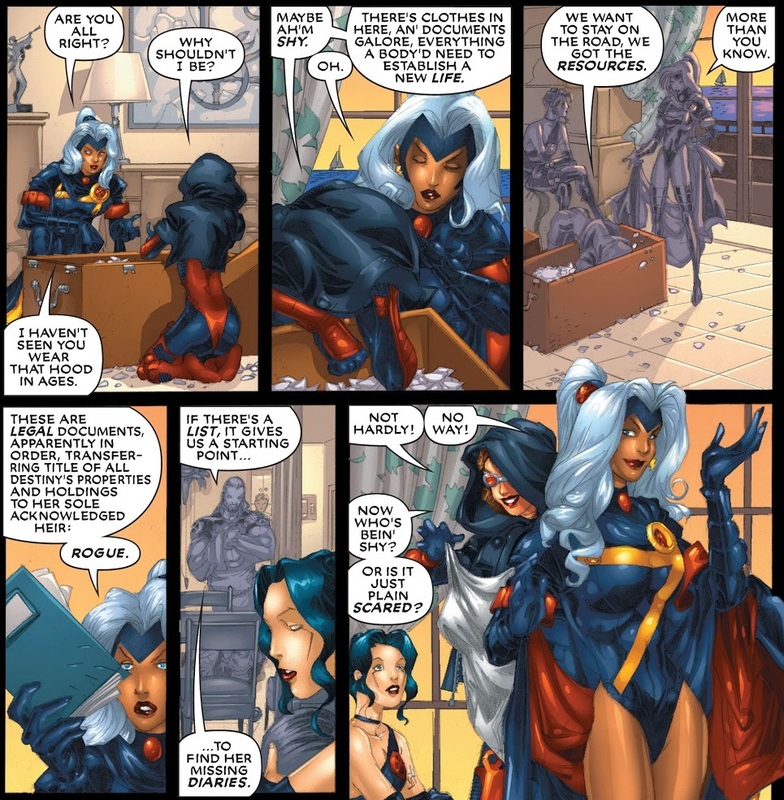 But not before leaving the child with Moira to rear (drawing a nice parallel to Mystique’s own giving up of Kurt). Moira, not unfamiliar with raising other bairns (i.e. Rahne), raises the child, who upon reaching his teens, like Crystal’s child, Luna, goes on to develop no powers. He develops a crush on Rachel, who rejects him for Franklin Richards! 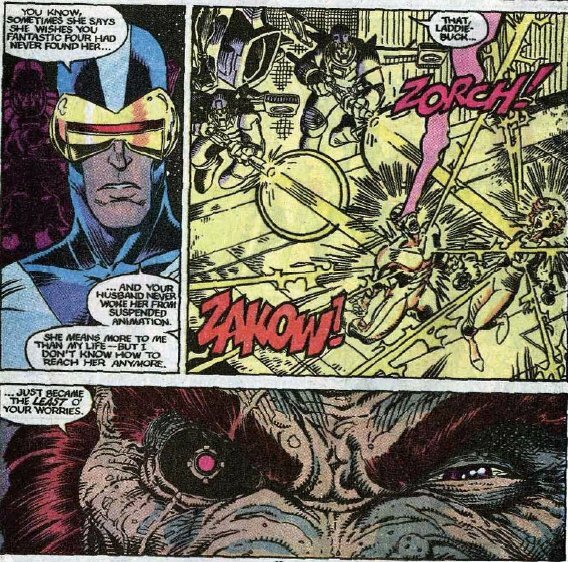 He takes the rejection harshly, considering the reason being because he is not a mutant, and goes on to develop a burning prejudice against mutants (much like the latter-introduced Graydon Creed). This anti-mutant prejudice brings him into some conflict, and he is left for dead (without arms, his right eye and left leg). But like Cameron Hodge before him, he survives, and submits himself to a process developed by the Genoshans, becoming “Master of the Hounds”, going on to enslave and humiliate Rachel; developing the Hound process in tribute to his father the Shadow King. 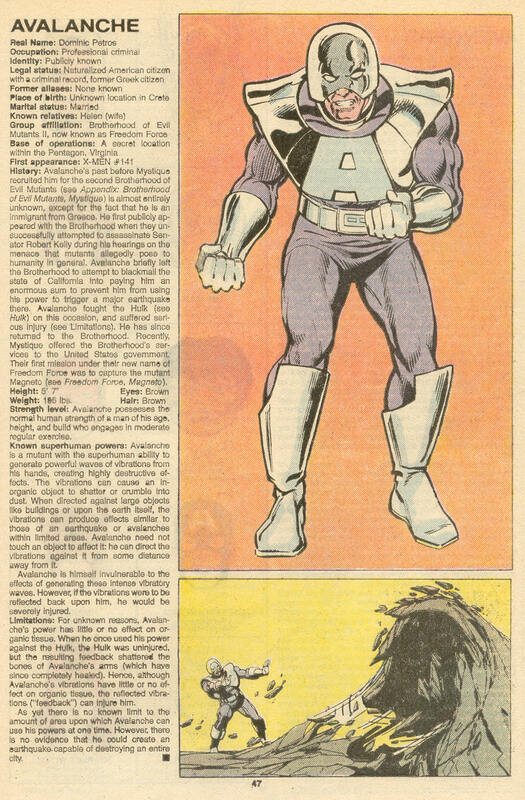 Note: His being raised on Muir Island would perhaps explain the accent Claremont imbued him with in Uncanny X-Men Annual #14; his crazy hair perhaps be explained by having Legion be the biological father (who was possessed by the Shadow King at the time). Readers will recall in Uncanny X-Men #209 Phoenix is abducted by Spiral. We never found out what occurred to her between this story and her appearance in Excalibur Special Edition #1. More recently (i.e. 2005) Jim Valentino revealed that his aborted plans for the Guardians of the Galaxy included establishing Jonathan Raven, otherwise known as KILLRAVEN, was the son of Franklin Richards. Now we know from the fundamental Days of Future Past storylines that Franklin was the lover of Rachel Grey. While we know that in one variant of this timeline Franklin and Rachel would go on to conceive the nigh-unstoppable villain Jonathan Richards, otherwise known as HYPERSTORM, it would seem that Valentino intended Killraven to be conceived from another variant of this particular timeline. It seems totally acceptable that both Hyperstorm and Killraven were alternate versions of the same character, Jonathan Richards, given their identical heights and similar hair colour. So what does all this have to do with the subject of this particular fanfix? 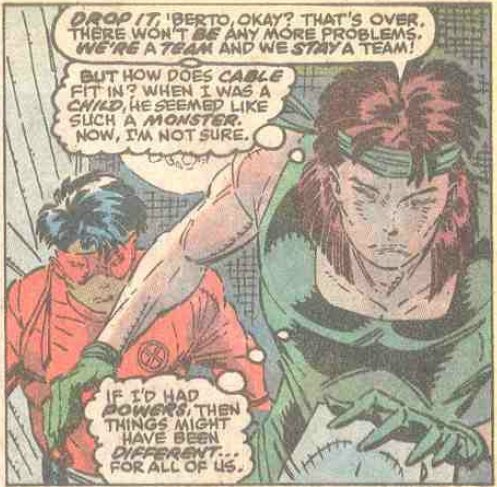 Well, while there has been much speculation over the years that Shatterstar has DNA that is identical to that of Longshot who was artificially created on Mojoworld – making him either his time-displaced son via Spiral/ Rita Wayward or Dazzler – this appears to be an exaggeration, since Shatterstar does not look physically identical to his supposed father, nor do they possess similar superhuman abilities. And none of us believe the mangled mess that he was really the transplanted consciousness of coma victim, Benjamin Russell, in the body of a Mojoverse contestant. However, I think most of what has come before can be resolved; but firstly by way of Jim Valentino’s plans to establish Killraven as Jonathan Richards. While Valentino never gave a thought to whom Killraven’s mother would be, given the Days of Future Past iteration of Franklin Richards it is safe to assume that she would be Rachel Grey. Secondly, there is the fact that both were trained as gladiators to fight for the amusement of their respective masters, Killraven for his Martian overlords and Shatterstar for Mojoworld; with both going on to become freedom fighters against their respective despotic regimes. Oh, and of course, like Hyperstorm, the similarities in their physical appearance! 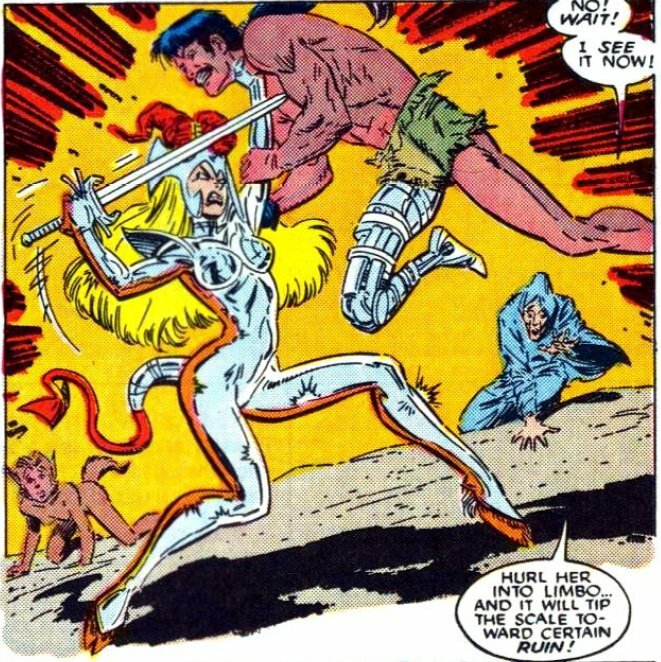 However, while there might appear to be a major hurdle to this theory what with Shatterstar having DNA that is identical to that of Longshot, I don’t see that as a major problem with Spiral being involved and having the Body Shoppe at her disposal. 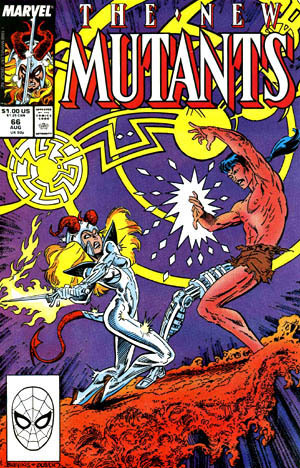 Given the extant of Spiral’s genetic tampering upon Psylocke (if we stick with Claremont’s original intention that she transformed Betsy into a Chinese/ Anglo-hybrid) it is easy to adduce that the mistress of the Wildways had tampered with Shatterstar’s genetic makeup to cover up his true parentage; particularly if she had stolen him from the mother. So to fix Shatterstar’s mangled mess of a parentage, in this instance I’d reveal that Rachel returned to our timeline carrying the son of Franklin Richards. Knowing this, Spiral lured Rachel to her “Body Shoppe”, using her magical powers to induce the pregnancy and leave no sign that she’d been “with child” in the first place. To cover her tracks, Spiral tampers with Jonathan’s DNA to make it appear as though the child was an artificial humanoid who had originated in Mojoworld. The purpose behind her actions? 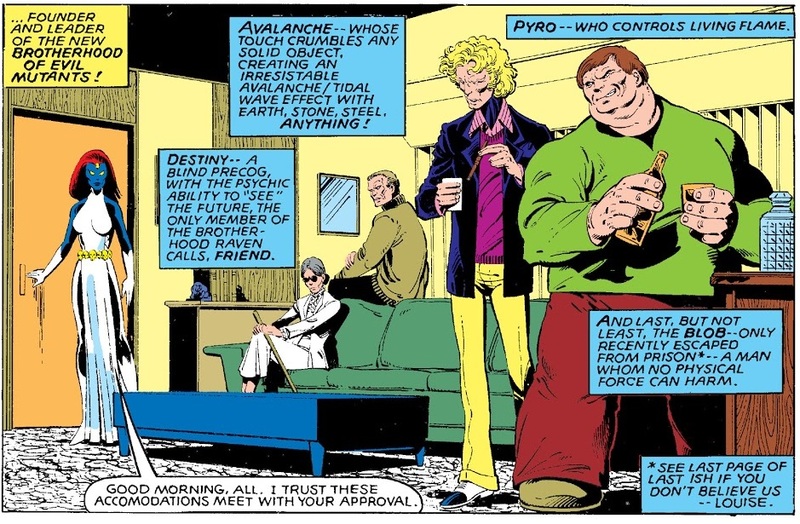 Given the failure of Longshot’s rebellion, and her undoubtedly discovering Rachel’s arrival to our time by way of the Phoenix force, she considered an offspring of the two most powerful mutants would possess the capacity to overthrow Mojo and thus free the planet from his regime, while also exacting her revenge upon him for his enslavement of her. But what about Benjamin Russell looking exactly like Shatterstar, you ask? The easy explanation is that she cloned the baby with the tech in her “Body Shoppe”, transplanting this clone on Earth as a “back-up” in the event Mojo uncovered her true plan and had him killed before he reached his true potential (in much the same way Stryfe was cloned from Cable). Postscript: Followers of this blog will know I have a much cooler theory for Killraven’s parentage but for the purposes of this fix I’ve taken a slightly different tack!